Tried Berea College a couple of years.Was drafted then volunteered for Army helicopter training,Ft Rucker,Al-Korea-Vietnam-Ft Benning Ga.1964-1967.Went back to VietNam from 1967-1971 as Lear Siegler Inc helicopter mechanic.Wounded in 1969(rockets don't recognize non-combantant cards).Married in VietNam,came home with a wife and three kids.Won the lower McRoberts School building with the high bid,lived in it until 1973.Moved to Valrico(Tampa) and worked in heavy equipment parts until Mar 31 2009 when I retired.Enjoying God's gift of 6 grandsons and 1 granddaughter. Two things,one cold snowy day Mr Snapp met us at the horseshoe curve and said if he could make it we could- - never got a snow day in my life! Second thing was being in Coach Morgan's history class -pop quizz most every day,eating bugs for grades- - he was great! Could you see him today in a classroom! Gary Wright has a birthday today. Gary Wright posted a message. New comment added. Happy birthday Connie,you finally caught up with me ! Gary Wright has a birthday today. New comment added. Gary Wright posted a message. Hope you had another happy birthday George . 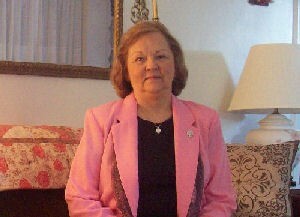 Ruby Delores Adams Whitaker posted a message on Gary Wright's Profile. Visiting JHS website. Hope you had a good birthday and have a good year ahead. Happy birthday Frances and thanks for keeping up with the information concerning our classmates. I don't look much different without the sea shells in my eyes! My daughter picked these up in Hawaii and that's the way God made the shells - - and me! 1959 COMMENCEMENT,DOES ANYONE REMEMBER "THE LAUGHING CAVALIER" SUNG BY RONALD MERCER? IN 2005 THESE WERE THE GRANDKIDS,NOTICE ALL THE BOYS(JUST LIKE THE WRIGHT'S)ADD GRAYSON AND THAT MAKES 6.REBECCA NOW 21 IN THE ARMY IN HAWAII,GARY NOW A FROSH AT USF AND IN NAVY RESERVE.THE UNITED NATIONS OF GRANDKIDS IS WHAT ONE LADY CALLS THEM. THEY ARE A BLESSING. TWO MORE WRIGHT BOYS,THESE ARE MY GRANDSONS,HAYDEN 6 AND GRAYSON 2. FLORIDA BOYS,BUT THEY BLEED BLUE.